Yamaha Rydeen Drums - Andertons Music Co. The Rydeen series is the entry-level Yamaha drum kit range. With over 50 years of drum design experience, the Japanese company has found a brilliant balance between quality and price with this particular line. Constructed from Poplar, Rydeen acoustic shells provide a strong mid-range punch that other beginner kits just can't quite match. Effortless to play for hours on end, Yamaha has made the Rydeen as simple to set up as possible, ensuring a great playing experience straight out of the box. As a beginner, you want the smoothest learning curve possible. That's why all Rydeen kits come with extremely reliable Yamaha hardware, akin to the pieces you'll found on their high-end counterparts. This means that you can play your Rydeen everyday without constantly making adjustments, so that you can progress more quickly. Yamaha Rydeen drum kits are available in a whole host of new colours, from sparkling silvers and burgundies to lush solid yellows and reds. Nothing is too outlandish or tacky, with Yamaha keen to maintain the stylish classiness that they're renowned for. Feel great, play great! 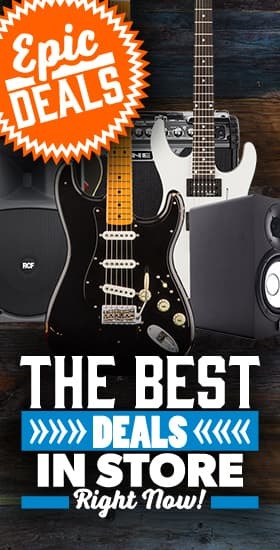 If you can't find what you're looking for then please contact us, or click here to view the entire Yamaha range at Andertons Music Co.